Alexis Sanchez said Arsenal lacked the self-belief to win the Premier League even before their back-to-back defeats by Manchester United and Swansea. 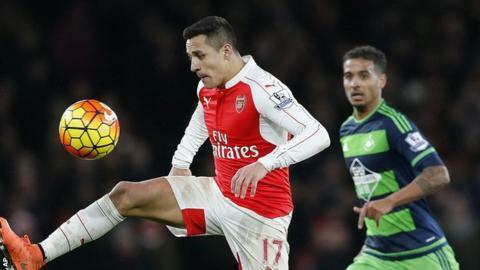 The Gunners lost 3-2 at Old Trafford and 2-1 at home to Swansea to slip six points behind leaders Leicester. "Sometimes we lack the mentality that we are already winning 1-0 when we go out on to the pitch," Sanchez told Directv Sports before the United match. "We lack this hunger to believe that we can be champions." Sanchez added: "If we go out onto to the pitch with hunger to become champions, to win the Premier League or the Champions League we can achieve it. "I remember a game against Manchester United last year. The lads looked hungry for silverware as we took to the pitch. "We crushed them in the first 20 minutes and went 3-0 up. We were hungry and brimming with confidence that day." Arsenal have only three wins from 11 games in all competitions and are third in the league. Speaking after Wednesday's loss to Swansea, Gunners manager Arsene Wenger also said his side's loss of form "looks a bit" like a confidence issue.